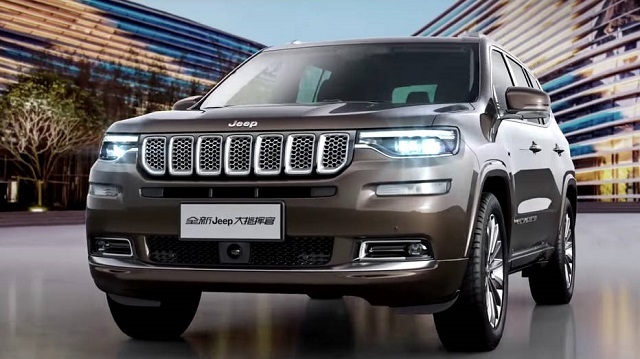 At the 2018 Beijing Auto Show, the Jeep manufacturer has presented its all-new three-row crossover SUV and it is a 2019 Jeep Grand Commander. From the instant, we could see many similarities with the smaller Grand Cherokee while it will get the same 4-cylinder unit also found in the Jeep Wrangler. However, the new Commander will be available for the Chinese market only, at least for now. Under the hood of the 2019 Jeep Grand Commander will be placed a 4-cylinder only, unlike in the other Jeep SUVs which are powered by a V-6 as well. It is a new 2.0-liter 4-cylinder turbocharged engine which debuted in the new Jeep Wrangler. In the Wrangler model, this unit is able to generate 264 hp and the torque of 295 pound-feet. In the Grand Commander, this engine is rated at 230 horsepower and 258 pound-feet of torque. It will be linked to a 9-speed automatic transmission and the front-wheel drive layout will be standard. However, the Commander will also be available with all-wheel drive system. The brand-new 2019 Jeep Grand Commander will ride on the stretched version of the Fiat Chrysler Automobiles’ Compact U.S. Wide (CUSW) architecture. It is the same platform which underpins the Cherokee model. As well, the Commander will share many styling cues with the Grand Cherokee. However, as for the dimensions, compared to the Grand Cherokee which is 182 inches long and has the wheelbase of 106.3 inches, the Commander is significantly larger. It has the length of 191.85 inches and a 110-inch wheelbase. 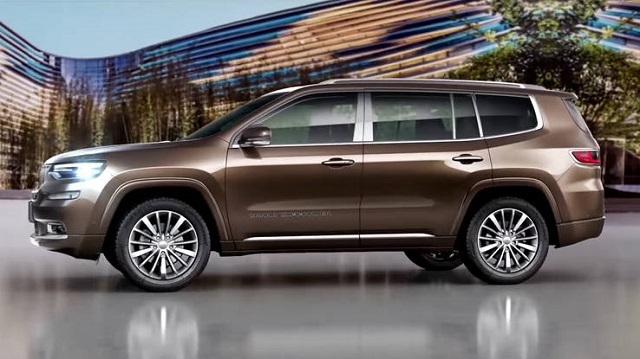 Looks-wise, we have already concluded that the Commander will borrow similar design cues from the Cherokee. This is especially visible on the front end with the same seven-slat grille and similar headlamps. However, the Commander features slightly longer headlamps and LED daytime running lights are positioned slightly higher so that it looks wider. Below the grille, there is a thinner center vent and rectangular fog lights. The profile of both models is also very similar with the same squared-off wheel arches. However, the rear end is a bit different with vertical tailgate and smaller tail lamps. The taillights feature a chrome trim which gives it more luxurious appearance. There is also a standard bumper and dual exhaust outlets. 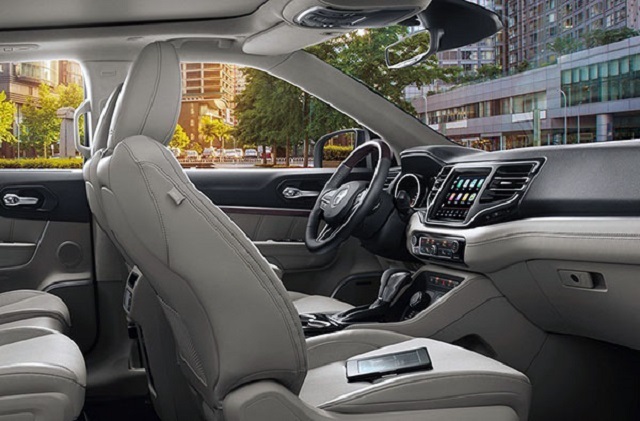 The interior of the 2019 Jeep Grand Commander is again very similar to the interior of the Grand Cherokee. There is the same dashboard design but the vents on the sides are a bit wider. The center console is, however, different. At the center of the dashboard, there will be an 8.0-inch touchscreen for the uConnect infotainment system which comes with Android Auto and Apple CarPlay connectivity. Furthermore, the Grand Commander comes with three rows of seats and can accommodate seven passengers. Both second and the third rows of seats can be folded down. In the higher trim levels, the seat will be upholstered in Nappa leather. For a more pleasant ride, it will come standard with three-zone climate control. The 2019 Jeep Grand Commander has just been presented at the 2018 Beijing Auto Show. Its price is expected to start at around $44,000.